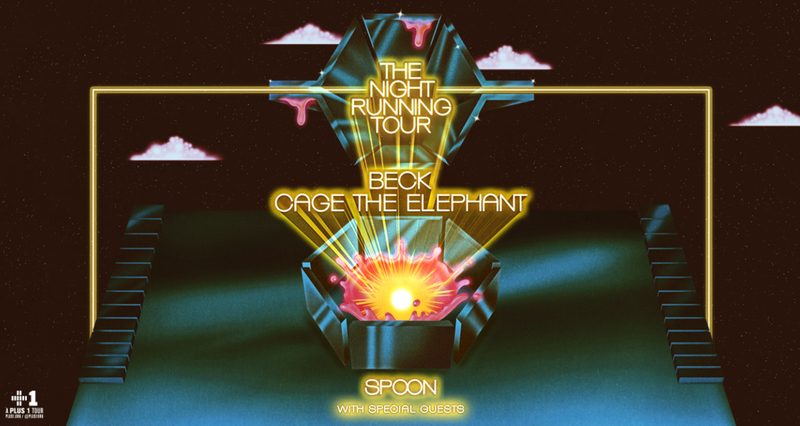 Tickets On Sale To General Public Friday, February 15 at 12:00 p.m.
Austin, Texas (Feb 11, 2019) – Today alternative, chart topping artists Beck and Cage The Elephant announced a North American co-headline tour across amphitheaters this summer – The Night Running Tour. Both artists are known for their amazing live performances and the energy they bring to their shows, making this an incredible co-headlining tour fans of both bands will not want to miss. They will be joined by special guest Spoon and Wild Belle on their Austin stop. Produced by Live Nation, the 28-city tour kicks off July 11th in Ridgefield, WA at Sunlight Supply Amphitheater and will make stops in Irvine, Las Vegas, Austin, Chicago and more before wrapping August 30th in West Palm Beach, FL at Coral Sky Amphitheatre at the S. Florida Fairgrounds. The tour stops in Austin on Friday, July 26, 2019 at Austin360 Amphitheater at Circuit of The Americas. Tickets for the Austin performance go on sale to the general public Friday, February 15th at 12:00 pm local time at Ticketmaster.com. You have until Tuesday, February 12th at 11:59 pm to sign up for Thursday pre-sale access. Austin’s most esteemed rock ambassadors, Spoon, continue their Hot Thoughts victory lap when they hit the road this summer with Beck and Cage The Elephant. The last two years have seen Spoon (“The greatest rock band of the 21st century” -The Ringer) not only release a unanimously celebrated album, but also play revelatory shows at clubs, amphitheaters, festivals, and both daytime and late night television stages. Hot Thoughts follows Spoon’s streak of three consecutive Top 10 albums—Ga Ga Ga Ga Ga (2007), Transference (2010) and They Want My Soul (2014) — and with it some of the bravest, most sonically inventive work from the most critically acclaimed band of the decade.